Buy both and get free shipping! This 1" leather martingale is adjustable and combines a strong latigo leather with tie dye bullhide. 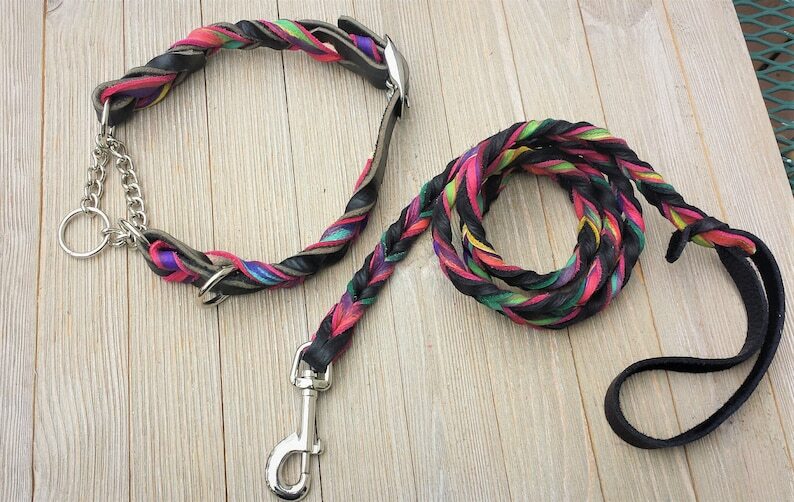 The matching leash combines black bullhide and tie dye colors. This is for a 24" neck. Each collar and leash is customized and truly unique and might be slightly different than the picture. We welcome custom color combinations for canine associations, AKC,, flyball and agility group. Please note that I try to put as much braid as I can given the size of the neck. It is recommended to measure the neck and not the collar. Leather Martingale, Braided Leather Martingale, Custom Leather Dog Collar, 5/8" wide. Leather Martingale, Braided Leather Martingale, Custom Leather Dog Collar, 1", 3/4" wide. 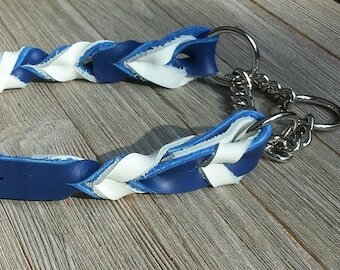 Braided Leather Collar, Custom Leather Dog Collar, 5/8", 1/2" and 3/4" wide.